Named for American explorer Zebulon Pike, Pike County was created by the territorial legislature on November 1, 1833 from Clark and Hempstead Counties. It was not until 1836 that a permanent county seat was chosen when Murfreesborough (later changed to Murfreesboro) was established along with a post office. The town is said to have been named by settlers who came from the town of the same name in Tennessee. Due to two courthouse fires, most of Pike County’s early records are unavailable prior to 1895, thus making much of Pike County’s early history difficult to research. However, a ledger of the County Treasurer’s records that dates to 1884 survived the fires and has been preserved in SARA’s collections. These records, which list county income and expenses, give a rare glimpse into Pike County history. 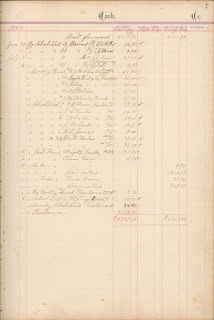 The columns record what was available in the treasury in currency, state scrip and county scrip. 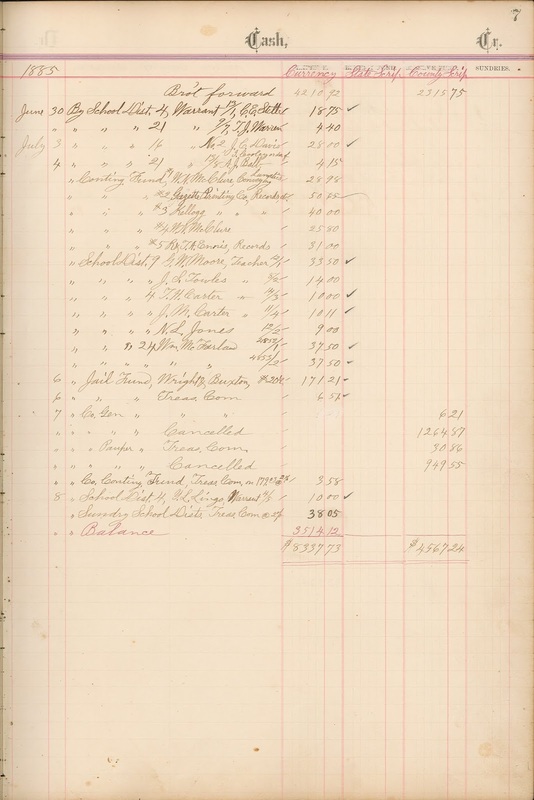 It also lists poll taxes collected and fees for teacher’s licenses, as well as payments for public school teacher’s salaries. With so much of Pike County’s early history lost, having such a record available is of great value to researchers.